- Connect: A highly reliable, easy-to-use homework and learning management solution that embeds learning science and award-winning adaptive tools to improve student results. 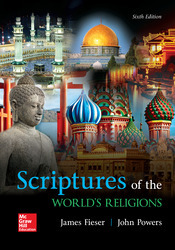 - Brings together many of the world’s most influential sacred texts, with the selected writings emphasizing each religion’s founders, central doctrines, and historical development. - This approach is more harmonious with the way each religion understands its own canon and allows readers to gain a sense of the historical development of ideas and practices.